Dive through underwater forests of colorful reefs to see sharks, rays and other incredible marine life. Relax on this sandy refuge by the sea. Hopkins Beach is a long stretch of sand with multiple resorts, plenty of watersports action and palm trees swaying in the breeze. 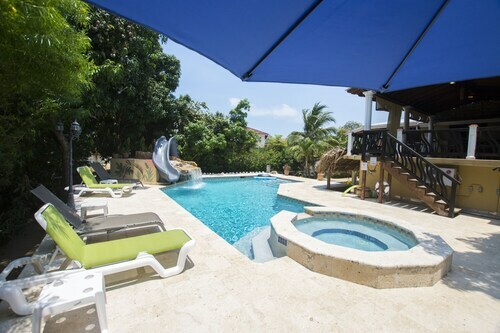 Enjoy ideal swimming conditions in the warm, clear waters of the Caribbean Sea. This tiny fishing village has grown in recent years due to its fantastic underwater treasures, most notably Glover Reef. This gorgeous beach area features year-round hot weather. Enjoy a picnic on the sand or purchase snacks from vendors. Go beachcombing with your kids to find shells, sea urchins and other marine treasures washed up with the tide. Sunbathe in this tropical haven or take shelter in the shade of a tree. Cool down with a swim in the clear water and watch colorful fish dart around your feet. Find a variety of watersport activities around Hopkins Beach. Go scuba diving through long networks of coral reef. If you’re not a diver, try snorkeling with the diving companies you will find at resorts along the beach or take a fishing tour of the nearby islands. Ride a catamaran out on the sea and look back at the excellent views of the beach. Stand-up paddle boarding has become popular too. 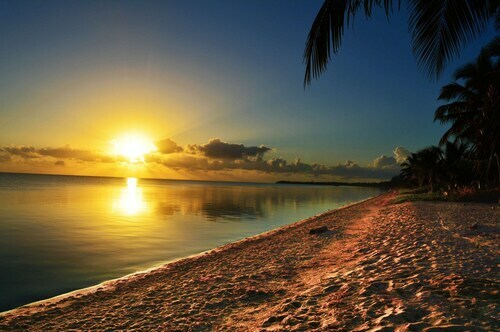 This beach is the perfect spot to give it a try. Learn about local concoctions and infusions at the Herbal Healers hut on the beach and tour the garden to see where their products are grown. 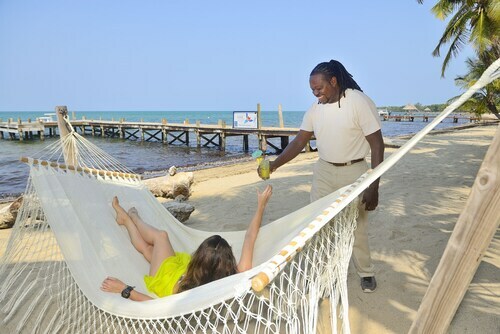 Try organic teas from Belize, along with juices and smoothies with medicinal properties. Dine at one of the charming family-run restaurants or cafés along the coast. From here, photos of the Caribbean Sea will provide great memories of your trip. 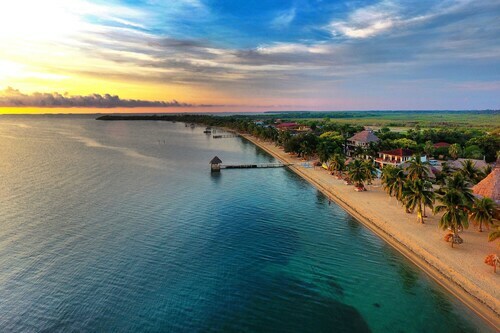 Hopkins Beach stretches along the east coast of the commune of Hopkins in the Stann Creek region of Belize. Walk to the beach easily from the center of the small village, as you are never more than four or five blocks from the sea. Hopkins Road is a large connection that joins the beach to the rest of Belize. Nestled on the beach, this Hopkins resort is within 3 mi (5 km) of Hopkins Beach, Anderson Lagoon, and Hopkins Pier. Cockscomb Basin Forest Reserve and Mayflower Bocawina National Park are also within 16 mi (25 km). Nestled on the beach, this Hopkins hotel is within 3 mi (5 km) of Hopkins Beach, Anderson Lagoon, and Hopkins Pier. Cockscomb Basin Forest Reserve is 12.3 mi (19.8 km) away. 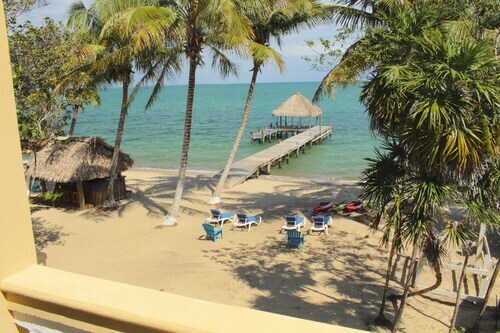 Located in Hopkins, this beachfront resort is in a national park and within 3 mi (5 km) of Anderson Lagoon and Hopkins Pier. Situated in a shopping district, this bed & breakfast is within 3 mi (5 km) of Hopkins Beach, Anderson Lagoon, and Hopkins Pier. Cockscomb Basin Forest Reserve and Mayflower Bocawina National Park are also within 16 mi (25 km). Situated on the beach, this romantic villa is within 3 mi (5 km) of Hopkins Beach, Hopkins Pier, and Anderson Lagoon. Cockscomb Basin Forest Reserve and Mayflower Bocawina National Park are also within 16 mi (25 km). Situated near the beach, this hotel is within 1 mi (2 km) of Hopkins Pier and Hopkins Beach. Anderson Lagoon is 2.9 mi (4.6 km) away. Nestled on the beach, this Hopkins vacation home is within 3 mi (5 km) of Hopkins Beach, Anderson Lagoon, and Hopkins Pier. Cockscomb Basin Forest Reserve is 12.9 mi (20.7 km) away.